Kaffemik in Greenland is the ultimate in social gatherings. “Come glad and eat cake” the message, but it is what the invitation does not say which makes kaffemik more of a social staple than just a fun get-together. It’s a way to meet friends and friends of friends and be ‘out on the town’. Good things to eat and drink are the common ground that brings community members together under the same roof and to the same table, but the root of kaffemik is a solidification of one’s bond to the celebrated one. Kaffemik happens all year round to celebrate birthdays, graduations, marriages, holidays, and more. 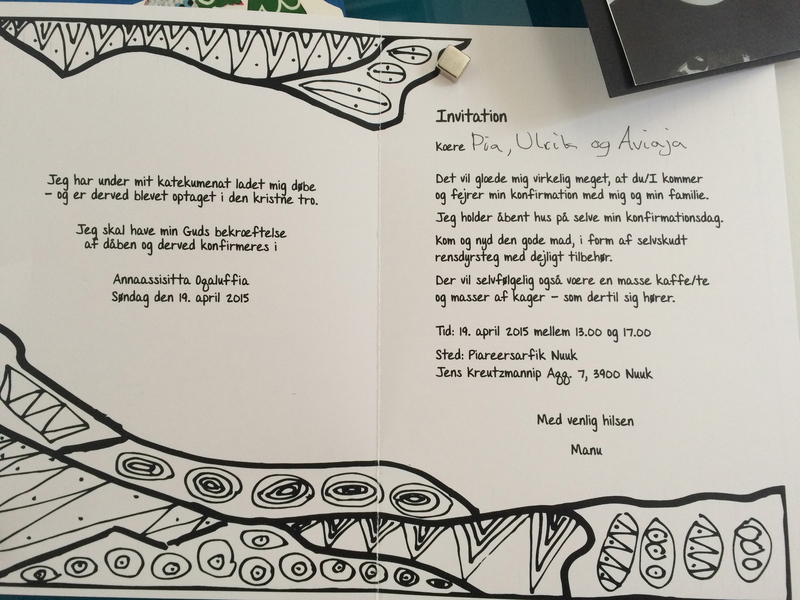 Here is an example of a beautiful kaffemik invitation to celebrate Confirmation. Written in Danish, translated to English below. It would be my great pleasure that you all come and celebrate my confirmation with me and my family. I am holding my own open house on my Confirmation Day. Come and enjoy good food such as reindeer that I have shot myself and lovely accompaniments. There will, of course, also be a lot of coffee & tea and tons of cakes. 19 April 2015 from 1:00 PM – 5:00 PM. 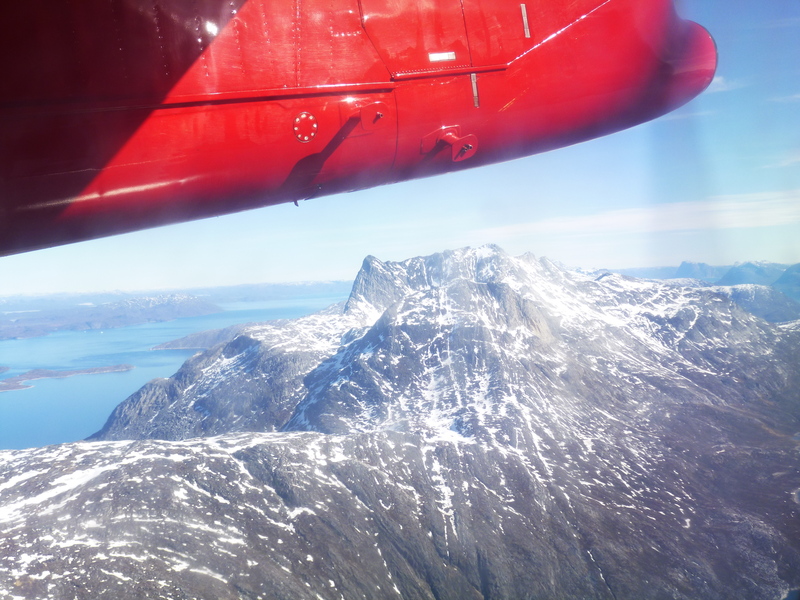 Air Greenland propeller plane overhead Sermitsiaq mountain in Nuuk, Greenland. Maybe there’s one or two things that can be a set-back to air travel in Greenland, but a difficult airport experience is usually NOT one of them! Simple travel… What a misnomer, right!? When I took on a new role at my job which created opportunities to travel throughout the United States, my first thought was how excited I was to be an ambassador for travel in Greenland on my home turf! BUT FOLKS! I have just seen the light about how to simplify travel, and wild horses couldn’t drag me back to the old ways of last month! I just finished a trip to Snowmass, Colorado for an adventure tourism conference, and it was a complete breeze thanks to these four lifesaver travel tips. Some of them are on no-brainer status, but when used in combination, it’s literally like having a red carpet rolled out for you!! 1. Only take hand luggage. It’s helpful on so many levels because you save time, avoid crowds, and save money! Save time twice because you don’t have to arrive to the airport as early as if you were checking luggage, and because you don’t have to wait at the Baggage Claim once you arrive. Avoid crowds because you don’t have to wait in a pesky Baggage Drop line. Save money because you don’t have to pay Checked Baggage fees. 2. Print your boarding pass at home. Self check-in makes life pretty easy, but what if I told you that you could simplify simple!? This tip is most effective when coupled with #1. If you have checked baggage, you will still have to wait in the Baggage Drop line. 3. Get TSA Pre-Check approved. This one is the TRUE cornerstone. There’s never a line in the TSA Pre-Check lane, but even if there were, it would move 10x faster than the 200-person line in standard security. The land where everyone has to strip down to their skivvies and then redress and repack on the “other side”. Instead, keep the shoes on. Keep the liquids in the carry-on. Even keep the laptop in the satchel! All for the minuscule (lifetime, I think) price of 100 USD. 4. Use Uber for the airport getaway car. When you arrive to your destination, you don’t have to vie for a taxi cab with the crowds while getting close-lined by someone else’s shoulder bag. You don’t have to find your way through the maze of Doors 1-39, Pickup Zones A-D, etc. to find the taxi stand. Instead, be picked up wherever you happen to exit the terminal. Know exactly which car is coming for you – down to the license plate and driver’s name! Pre-enter your destination address so the driver doesn’t even have to ask “Where to?” And if you shell out the big bucks for UberBlack, be treated to cold refreshing waters, gum, and whatever else the driver wants to do to work for his/her 5 star rating. So there you have it! Four little ways that can make your travel experience dare I say, easy! What do YOU do to simplify travel? Photograph by Mads Pihl – Visit Greenland. Summer is (nearly) upon us, which means it is almost prime hiking season in Greenland. Ski boots and winter jackets put away, hiking boots and gaiters unpacked! To some, hiking is what you call a relaxing Saturday afternoon. A nice easy day trip to the hills to enjoy nature, pick berries, sit and drink a coffee, and maybe even have a barbecue on the rocks. It can be done anywhere in Greenland as there is backcountry everywhere. To others, hiking is more of a walkabout. A much-anticipated, longer trek that not only transports you from Point A to Point B but also has possibility to transport you on a more spiritual level. You get away from the hustle and bustle of everyday life, you reignite your love affair with nature, and maybe you even push yourself in a new experience. 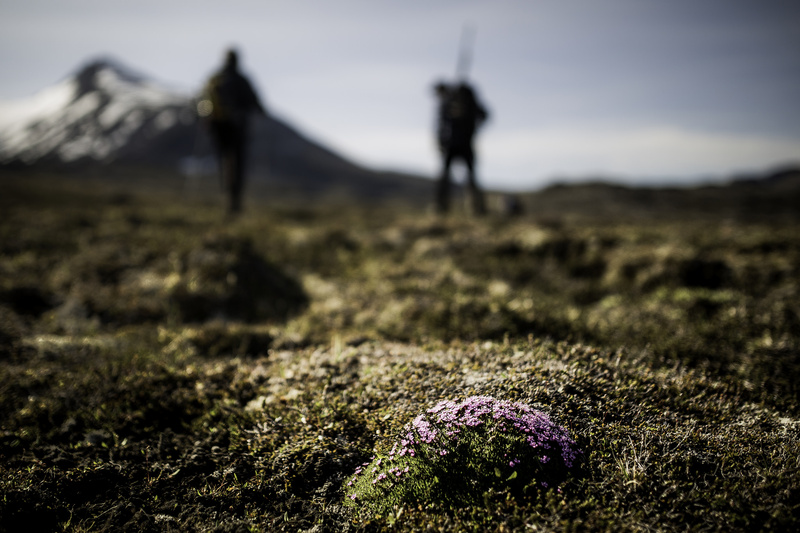 If this is your kind of hiking, then the Arctic Circle Trail in Destination Arctic Circle is for you! in my article Hiking the Arctic Circle Trail on visitgreenland.com. Or watch in live video! in my Ultimate Greenland Hiking Guide on visitgreenland.com. And if you still can’t get enough, see here for my other blog posts about hiking in Greenland.